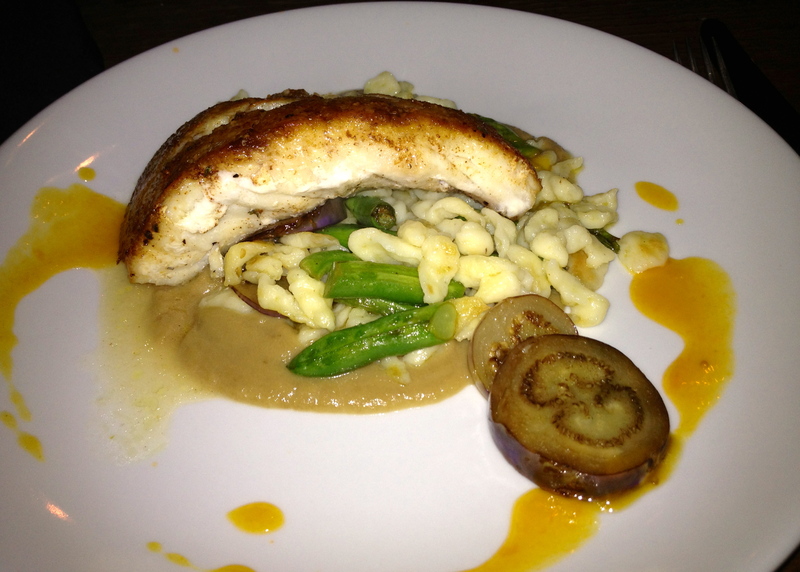 Recently at Date Night headquarters, we were discussing the dearth of good restaurants on the square in Marietta. The Decatur square is amazing as is Canton Street in Roswell, but Marietta’s square is not one of our favorite dining destinations. Bev, an old friend, is in town (she’s not old, but the friendship has lasted a long time). Our solo offspring Elliott is in town too and we want to go somewhere special. 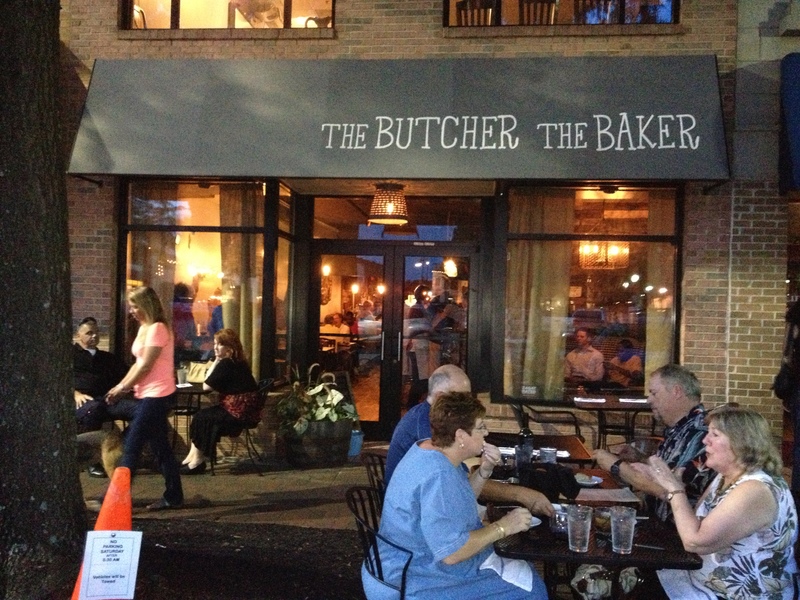 We are headed to Roswell until I see a blurb in the local paper about The Butcher The Baker on the Marietta square. With a few quick clicks on the internet, we have a reservation. The chef and the pastry chef are married, and that’s where the name of the restaurant comes from. Evidently, there is no candlestick maker on staff. You can sit inside or out. The restaurant used to be Simpatico, which we never did get to try while it was here. Our table is in the back, where we can watch the flurry of activity in the kitchen. We are greeted by an offering from the baker. A nice start to the festivities. 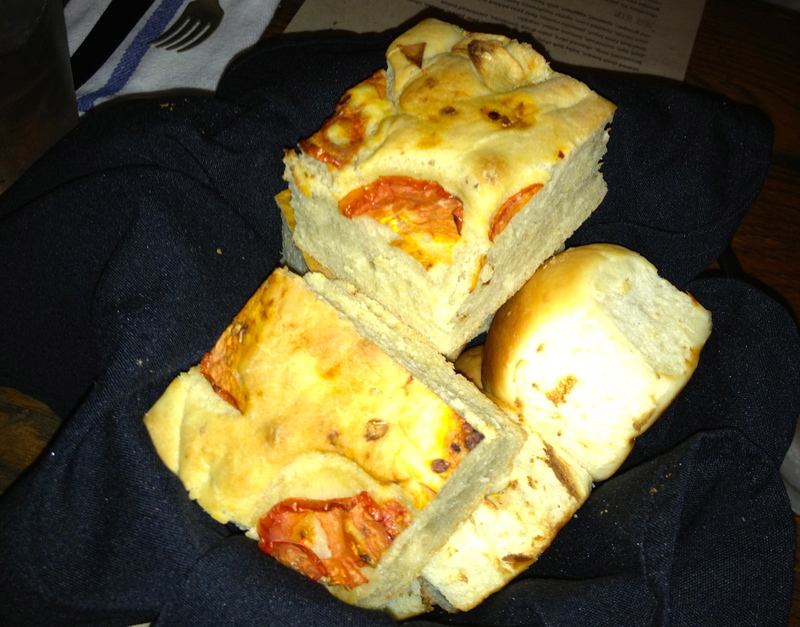 Tomato-garlic focaccia and buttery dinner rolls begin the feast. The focaccia does not last long at this table. There is a refrigeration problem tonight and none of the beer taps work, so we must order bottles or cans from the nice list of 18 choices. 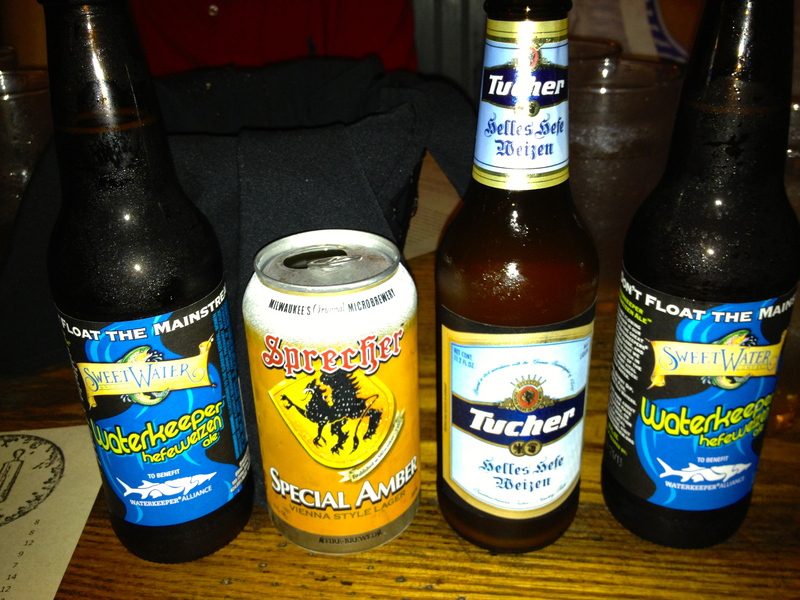 Two of us get the Sweetwater Waterkeeper as well as a Sprecher Amber and a Tucher Hefeweizen. The Tucher is very German and an excellent wheat beer. The Sprecher is surprisingly hoppy. The Sweetwater is the surprise of the bunch, tasting very Belgian. Elliott remarks that it tastes like a Leffe and I agree. It’s a nice beer from right here in the ATL. We order some appetizers with our beer. The cheese plate features a goat cheese and two cow cheeses. 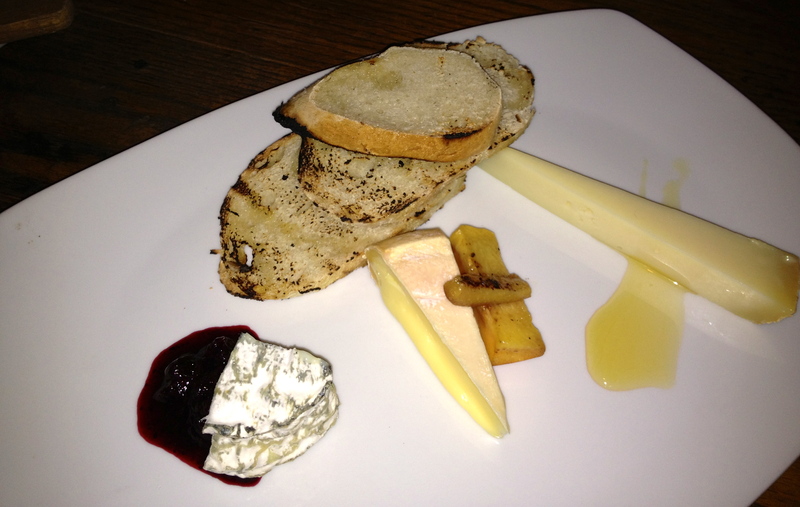 There’s some honey, a pickled peach and some blueberry jam to counteract the strong cheeses. It’s good, but we also need to order something cooked from the appetizer menu. Pig and fig. Nice name! 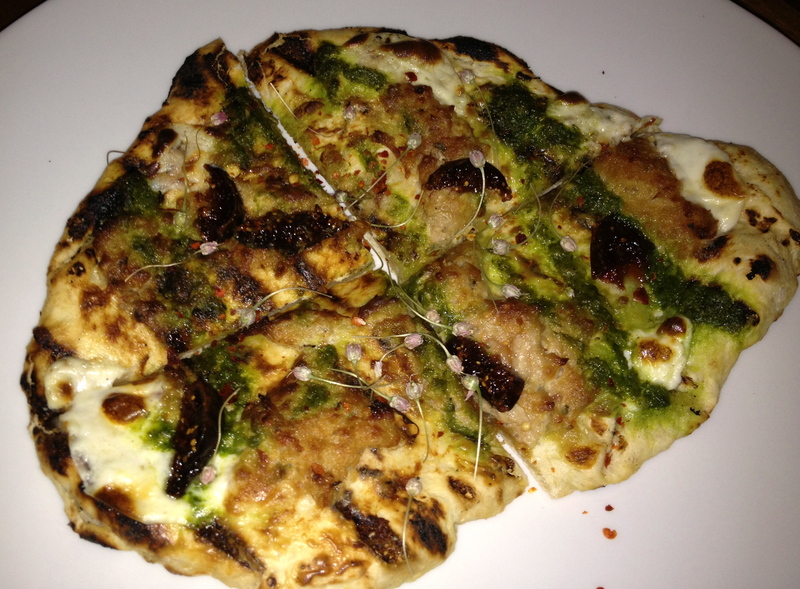 They call this flatbread the “Pig and Fig”. It’s got pork sausage and roasted figs along with pesto and marscapone. This is an interesting dish. The pork is a bit spicy and that is offset by the sweetness of the fig and the parsley in the pesto. Looking around the room between courses, it’s packed. The beautiful people of Cobb County are here and they are having a good time. In contrast, we can see an empty Willie Rae’s next door (Date Night #28, 4/27/2012) through a connecting doorway. Bring on “The Butcher”! The four of us order three entrees. Elliott gets the pork loin. 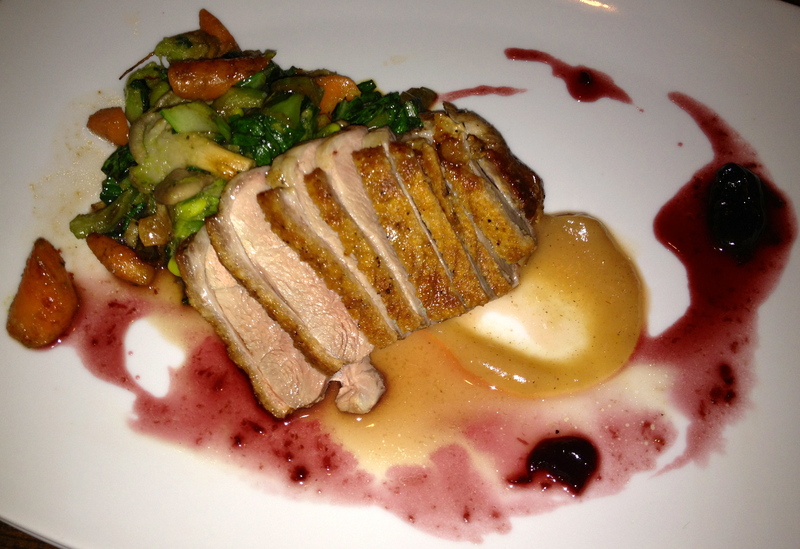 Sufferin’ succotash, it’s the pork loin. 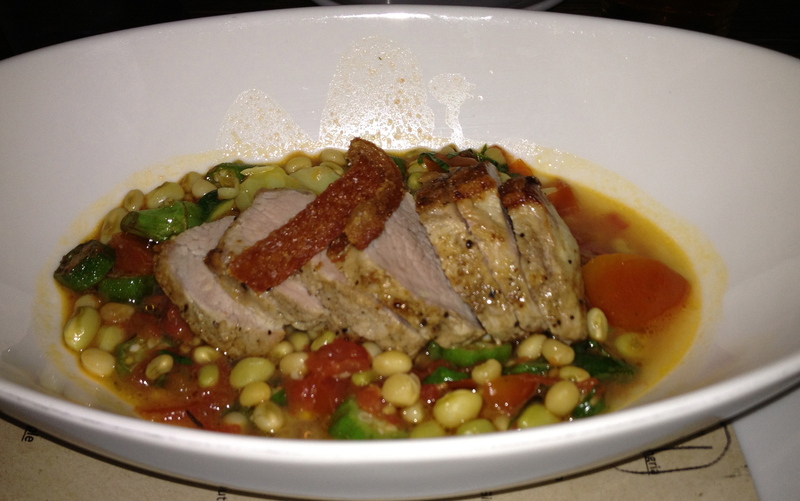 The pork comes with succotash and us served in a tomato water. It’s thinly sliced and moist. I don’t believe Elliott offered us a taste, but he did enjoy all of it. Bev gets the red grouper. The fish is served on top of spaetzel (how German!) with pole beans and eggplant. The fish is moist and light inside, but the outer cooked part is very salty. Eve and I split the duck breast so that we will have room for dessert. There’s bok choy, carrots, and edamame in the Asian-flavored vegetables that come on the side. The duck is cooked medium, just as we ordered it and is very good. The portion sizes are not huge, but if you are light eaters or want to try many dishes, you might want to split your entree. 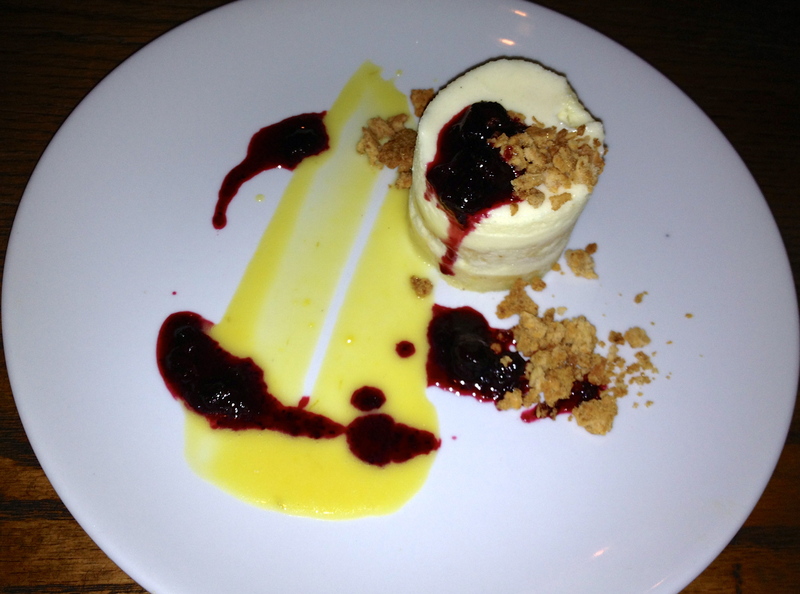 The desserts are listed under the “Save Room” portion of the menu and we are glad that we have done just that. It’s time for “The Baker” to show us what she’s got. We get two desserts for the table. The first is an almond frangipani with blueberry compote, key lime curd, brandy snap and creme cheese. The Baker does a great job on this one. It’s peach season in the Peach State. The Butcher The Baker is a farm-to-table kind of place and for our next dessert, we get some local Georgia peaches. 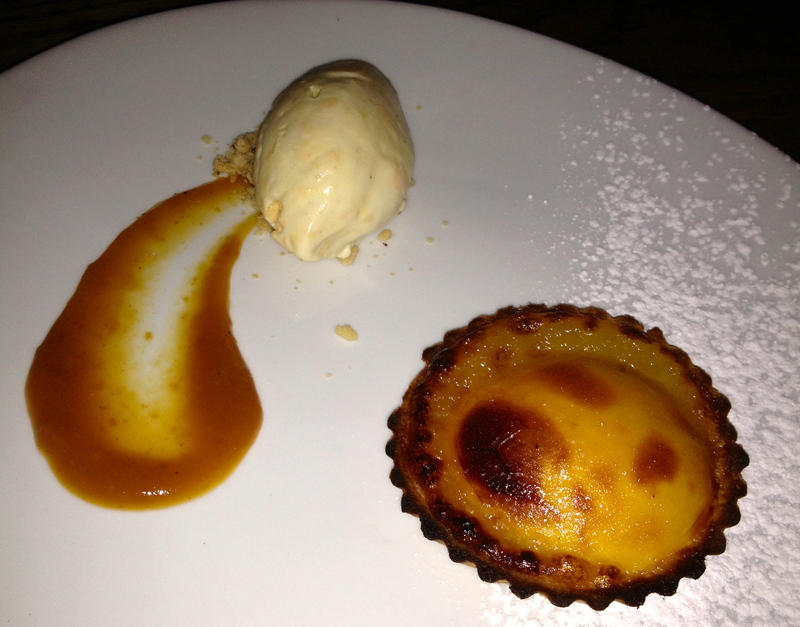 It’s a brown butter peach tart, which caramelized peach jam and peach ice cream that is made here. It’s a really nice way to use Georgia’s state fruit and an excellent end to our meal. 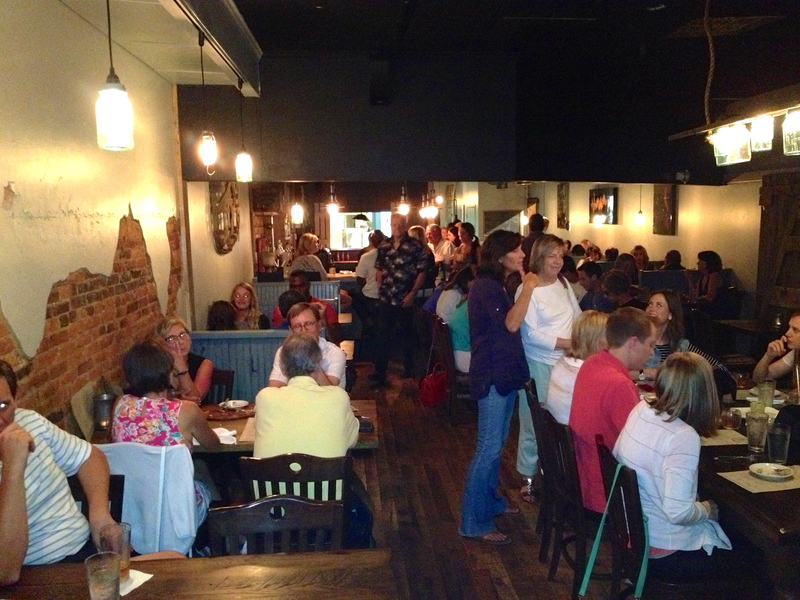 The Bottom Line on The Butcher The Baker: Finally, there is a place for “foodies” in the Marietta square. If they can get about four more places like this (including a great beer bar), Marietta will be right up there with Decatur. It’s not cheap, so go on a special occasion and hang out with the cool people in Cobb.